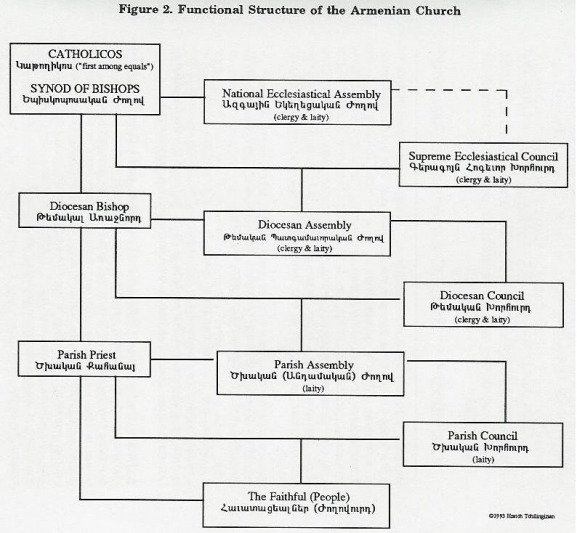 The functional structure of the Armenian Church (see fig. 2) is base primarily on the canons of the Armenian Church which were compiled over the centuries. One of the most important aspects of the Armenian Church administration is its Conciliar System; i.e., the administrative, as well as doctrinal, liturgical, and canonical norms are set and approved by a council - collective and participatory decision making process. The Council of Bishops (or the Synod) is the highest religious authority in the Church. On each level, clergy and lay cooperation is central to the overall administration and ministry of the church. While the Church is governed according to the standards set forth in the Canons, there are complementary By-Laws in most dioceses that further define the role and relationship of each functionary in the church within a given region. In view of contemporary realities in Armenia and the Diaspora, the fundamental question that the Armenian religious and lay leadership faces is whether it is ready to assume a "prophetic role" in the life of the Armenian people at this critical and historic juncture or it will continue with the status quo? The fact that the Armenian Church is a national church does not relieve Armenians from their responsibility to preach the Good News of Christ. The "Armenian" aspect of the church should only be the context of the message and not the content.